The headquarters of the Imperial Guard Division in bygone days, standing in ‘Kitanomaru Park’ in Chiyoda-ku, Tokyo, is used now as The National Museum of Modern Art, Tokyo. The old headquarters building built in 1910 is one of the representative Western-style buildings of the day. Japan’s Imperial Guard Division, which formally started in 1891, had a role in protecting the Emperor and the Imperial Palace grounds in peace time, and occasioanlly it went to the front as the strongest army division in wartime. The Crown Prince had to join this division，as he was the future Emperor, the commander-in-chief in those days. The Emperor Taisho and Showa, the grandfather and father of the present Emperor respectively, were the members of this division when they were the Crown Princes. The soldiers of the Imperial Guard Division were carefully selected from the applicants throughout the country, and the special uniforms were supplied in that they could stand out as an elite group. This division was broken up toghther with other military divisions right after the Second World War. Present Emperor and Imperial Palace are guarded by the Imperial Palace Guards, one of the police departments. 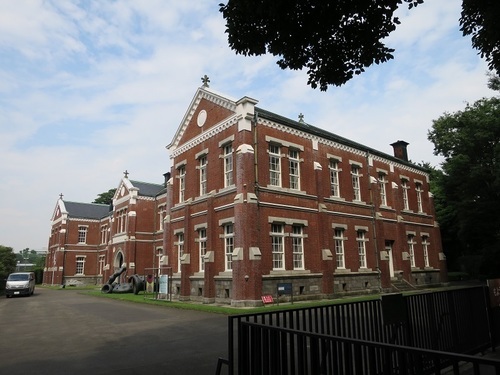 This old building in the picture, designated as an important cultural assset, is opened to the public as a National Museum.